It was written by Kevin Jones from the Association of the Ragged Trousered. I was recently in a movie commemorating the centenary of the publication of The Ragged Trousered Philanthropists by Robert Tressell. Kevin was at the showing of the film with his stall of books. At the end he approached me somewhat bashfully with a piece of paper containing the lyrics to this song. I read the lyrics and loved them. Because of that, and because Kevin does such great work with the Association of the Ragged Trousered, I offered to record his song. So here it is. It’s a real cracker I think. I hope I’ve done it justice. Some final words now about the Association of the Ragged Trousered. It’s a fabulous not for profit venture and its aim is to expand the readership of The Ragged Trousered Philanthropists. They raise money to buy the book and then they give it out. Fabulous isn’t it. 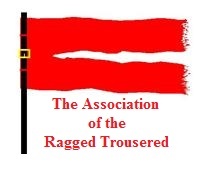 You can join the Association of the Ragged Trousered by clicking here. I hope you enjoy Kevin’s song as much as I do. So essentially, the Association of the Ragged Trousered are like the Gideons but are actually promoting a book worth reading?